Experts have determined that conception after cancer, even breast cancer, is safe. Unfortunately, many cancer treatments can leave women infertile and unable to conceive. Modern science, however, has made it possible for women to take preemptive measures to help secure their ability to conceive, experience pregnancy and raise a child, even if cancer treatment leaves them infertile. 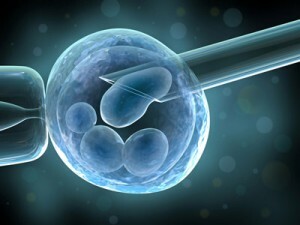 There have been many success stories regarding fertility preservation. Yet, researchers have recently found that very few women actually take measures to secure their ability to conceive later in life. This leaves fewer options for starting a family – surrogacy, egg donors and adoptions – all of which are very expensive. In a study that was published in the March 26 online version of the medical journal Cancer, researchers took a look at the fertility preservation decisions of more than 120,000 women in the California Cancer Registry database. Women involved in the study were diagnosed with one of five types of cancer between the ages of 18 and 40 (leukemia, breast cancer, gastrointestinal cancer, Hodgkin’s disease or Non-Hodgkin’s disease). Of the women queried, 1,041 women responded and 918 of them had received cancer treatments that could affect their fertility later in life, including chemotherapy, pelvic radiation, bone marrow transplant and pelvic surgery. After receiving the completed surveys, researchers examined sociodemographic characteristic like age, gender and ethnicity as well as the overall odds of taking fertility preservation measures. Overall, researchers found that 61% of all women had been informed about their potential fertility loss after treatment. Yet only 4% of all women decided to take fertility preservation measures. The rate did, however, see a slight increase over time, moving from only 1% in 1993 to 6%-10% between 2005 and 2007. The overall results brought researchers to the conclusion that, while women are being informed about the potential loss of fertility, they may not be receiving adequate information about their options to preserve fertility. Researchers also found that certain groups of women were more likely to receive information about fertility preservation than others, particularly women that were younger, Caucasian, childless, heterosexual and college educated. The fact that certain sociodemographics led to a lack of counseling is disheartening, to say the least. The number of women queried in the study represents just one year of cancer diagnosis among women per year.